Western Star Gifts is often asked how to clean and care for copper jewelry. Although our handmade copper jewelry is protected by a clear lacquer finish it can oxidize and turn color in time. We have listed some hints and tips for copper care. If you have any further questions we are always happy to answer them to the best of our ability. Copper oxidizes when exposed to air and turns a patina green which can leave a stain on the skin. A protective coating has been applied to the handmade copper jewelry to help prevent this from happening. Because some people have more acid in their system, this coating may wear off quickly. Others can wear copper for a long time with no cleaning or polishing required. If the copper tarnishes, we recommend first cleaning the copper jewelry with a jewelry cleaning cloth. Use one that is specifically designed for copper or for all metals. Polishing the copper regularly helps to keep the shiny luster of the copper. It also helps prevent the buildup of tarnish on the jewelry. Left alone the copper jewelry will begin to develop a lovely green patina. Many people prefer to let the copper oxidize naturally until it achieves an aged or antiqued appearance. Since the protective coating may eventually wear off the copper jewelry can be re-coated for lasting protection. Many jewelry craft books recommend the use of an acrylic spray sealant which is available inexpensively at most hardware stores. It is also easy to apply. In a well-ventilated area just spray the copper jewelry with the sealant and let it dry thoroughly. For added protection you can apply several coats. Then re-apply as necessary but always clean the copper jewelry before using this technique. If copper jewelry is badly tarnished it can be cleaned with ketchup. Just cover the jewelry with the ketchup, let it sit for a minute and then rinse thoroughly. Dry the copper jewelry with a soft cloth. This method is quick and easy but may remove any finish left on the jewelry. When the copper jewelry is not being worn it can be kept in a sealed ziploc bag. This reduces oxidization and helps prevent the copper from tarnishing. Anti-tarnish carbons strips from 3M can also be placed in the bag with the jewelry or in a jewelry box or case. Anti-tarnish carbon strips are available for sale in our eBay store. Who Makes Our Copper Jewelry? Most of our copper jewelry is designed by a Canadian artist named Tony who has won awards for the originality and quality of his craft. Over many years, Tony developed the techniques that are unique to him. Although he originally handcrafted all of the jewelry himself, Tony now employs a small team of skilled artisans whom he has trained in the techniques of his unique craft. We were privileged to meet Tony at a craft show several years ago and have been associated with him since that time. He amazes us every year with all of the new product lines which he designs. The quality is superb! 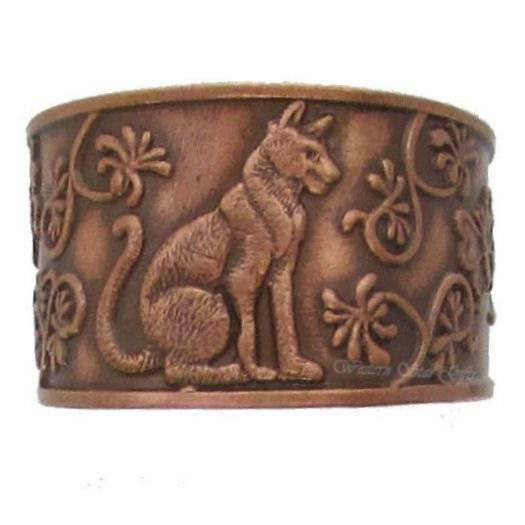 Copper jewelry has been worn for thousands of years for relief for the pain of arthritis. Today it is widely used as a therapeutic remedy for many conditions such as tendonitis, bursitis, fibromyalgia, carpal tunnel and rheumatism. Natural remedies have become the arthritis treatment of choice for many people in recent years.